The end of Mexico. 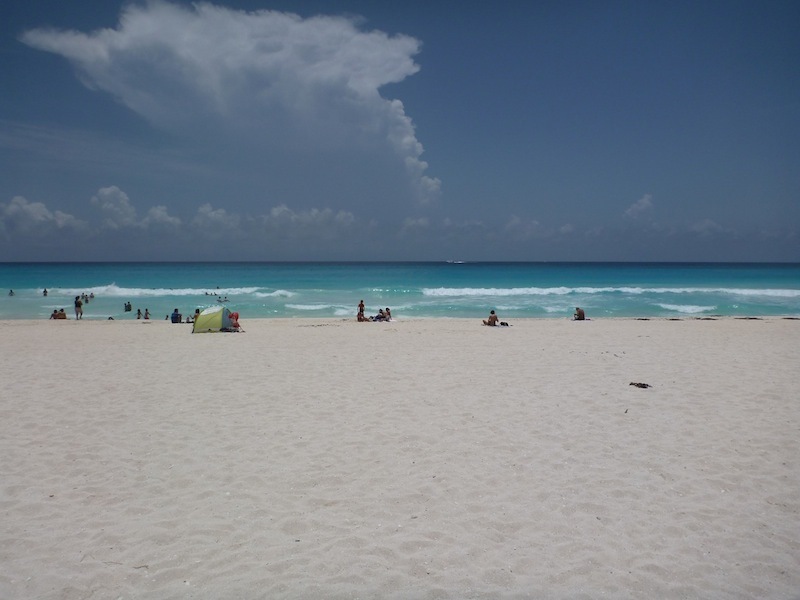 The Caribbean Beaches of Cancun. I have reached the end of Mexico. I am now in Cancun the most eastern city of Mexico perched on the Caribbean coast of this immense country. This city is the official end of Stage 4 of the Tour de Zack AKA Operation Glorious Ruination. 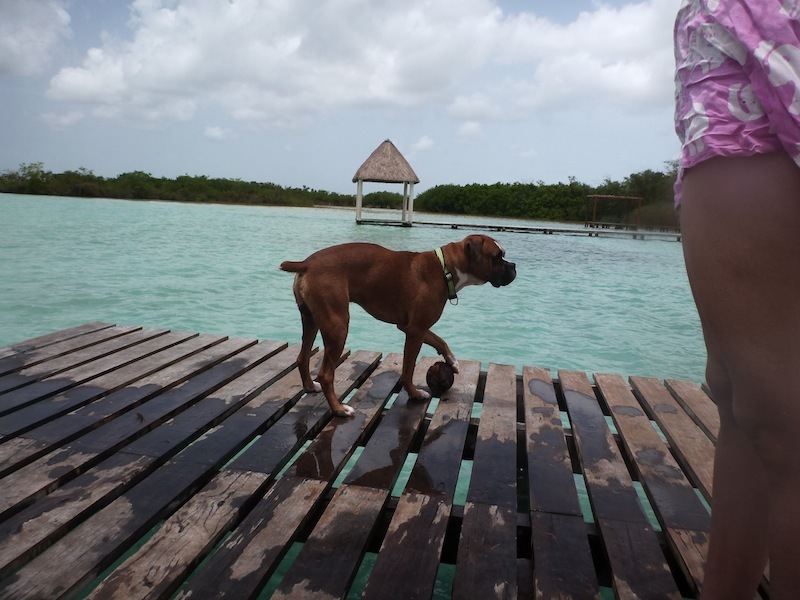 Helena, Ylenia, Paco, and I soak up the rays in Cancun. We’ve come a long way this stage. Just looking at the map and the implausible distances and it feels like years ago that I was hanging out in Mexico City with my friend Polo. Tony and I have covered 2940 km in the last 2 and half months and the changes of scenery on this leg have been dramatic. From the dry mountains around Mexico City and the colonial beauty of Puebla we aimed ourselves south and before we knew it we were in the tropics, lounging in a hammock – beer in hand – and adjusting to the oppressive heat of the southern Oaxacan coast. Then, it was into the jungly mountains of Chiapas and, as we climbed, the jungle became forest again before we reached the cool mountain town of San Cristobal de las Casas. It was in Chiapas that the rainy season seemed to kick in and so we had to swim our way out of the mountains and down to the jungly flat of the Yucatan Peninsula. Once again the oppressive heat and humidity weighed heavy upon us as we crossed this massive flat expanse of jungle before emerging victorious on the Caribbean coast with its cool cenotes, beautiful lagoons, and this-is-the-definition-of-paradise beaches. More on Yucatan later. Two thousand, nine hundred and forty kilometers. That’s the distance from Paris to Istanbul. It’s no small feat, and the truth of the matter is that it has taken it’s toll on both Tony and I.
Tony soaks up some rays in Playa del Carmen. AKA Playa. Reunited for the third time in the last two month, my buddies from Mexico City Oscar and JC enjoy a few choice bevvies before we head out for a night out in Playa. It´s called ¨running repairs¨ for a reason and it has started to get a little bit frustrating. 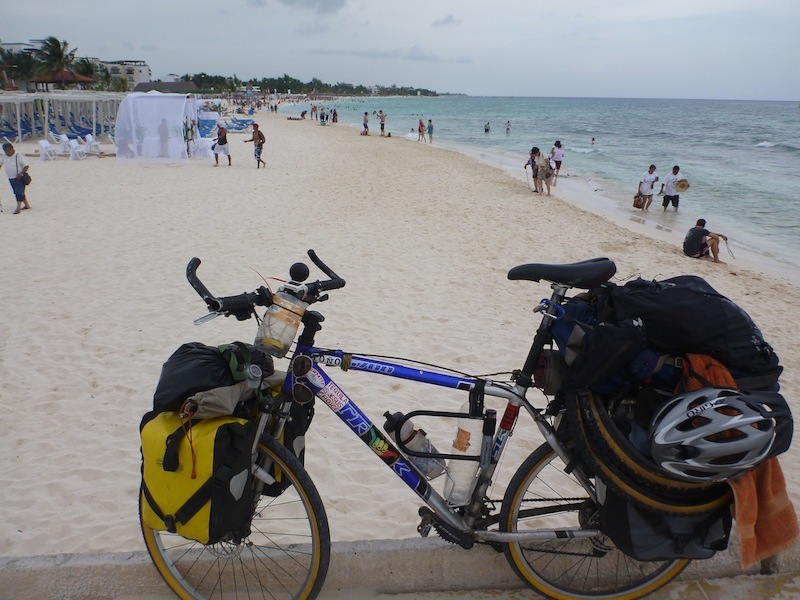 The fact of the matter is that Tony was not designed for a trip like this, he is a high performance mountain bike, not a purpose built touring bike, and as each 1000 km goes by, the strain on the poor boy becomes more and more apparent. The weather isn’t helping either. Heat and humidity might be good for the old folks in Florida, but Tony isn’t human and it does him no favours. Even if he didn’t need to ride 4000km, just spending the next 5 months outdoors in this climate will be tough on him. 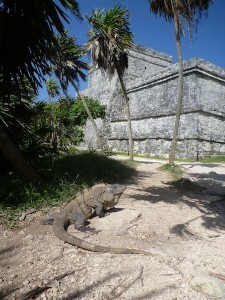 Tulum Ruins. Note the outrageously fat Iguana. Headphones are broken, only one of the buds still work… sort of. Batteries for bike lights and head lamp all need to be replaced. Under the sea. 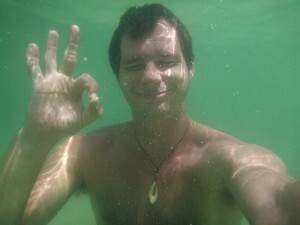 Chilling at the bottom of the lagoon in Pino Suarez just south of Tulum. Finally, the engine of this enterprise (me) is starting to get worn out. Physically speaking, after 7 months on the bike, I continue to slowly wear away. I have lost more weight this stage, and my upper body continues to get leaner and meaner. Also, I have been having some knee trouble the last 500 km. Mentally and spiritually speaking, I’ve been struggling a bit. On the day to day front I’m doing fine. Spirits are high, life is good. That said, Traveller’s fatigue has really started to kick in now after 10 months of travel. At times I am feeling a bit lazy, a bit stretched out, and yes, tired of the bike. 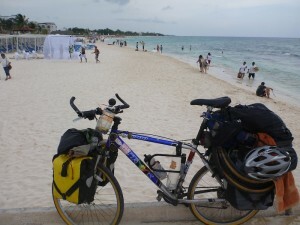 Coming to the end of Mexico has been huge relief as I am now about 70% of the way there. However, with still 4000 km, 9 countries, and 5 months to go before I expect to arrive in Colombia, I’m going to need to rest up before I can jump that mental hurdle and get back on that bike. Clearly, I need a holiday from my holiday. So it’s time to hit the RESET button on everything so that we can start out fresh when we cross the Belize border and head into Central America. Tony will be taken apart, cleaned, greased, and then put back together again. New brake pads and other spare parts we can’t find here will be ordered. Every piece of my gear will be gone through piece by piece and if I don’t think it will survive the journey to Colombia, I will be replacing it. Also, I will be going through my stuff – gram by gram – to see if we can’t lighten the load a bit. And as for me… I will take my holiday from my holiday. I’m going to Cuba later this week and leaving Tony behind. I need some space. A special mention goes out to Paco, my couchsurfing host and all around good guy here in Cancun. Not only has he been hosting me the last couple of nights, but he’s going to give Tony a home while I am away. You know, tuck him in at night, make him a warm glass of milk when he can’t fall asleep, read him bedtime stories… that kind of thing. 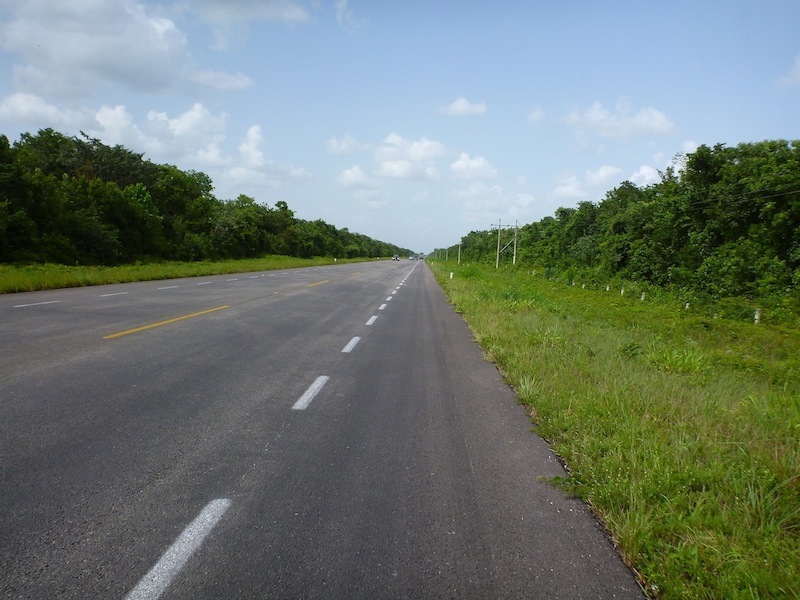 What the road in Yucatan looks like. Plenty more of road to come! Hola Zack que azaña te has propuesto, me dejas con la boca abierta. Me da mucho gusto haberte conocido y si necesita algo en Cancun sabes que cuentas con nosotros. Muchisimas Gracias Monse! Tambien me da mucho gusto haberte conocido (y Mizra, y su hijo, y sus vecinos). Gracias por la fiesta de anteayer, estuvo un gran placer. Con suerte me podria recorder la formula por los viejitos! Saludos a todos, y un abrazo fuerte por la carina Joy! Dude I hope that you enjoyed your time in México! Hopfully we will see each other again man! 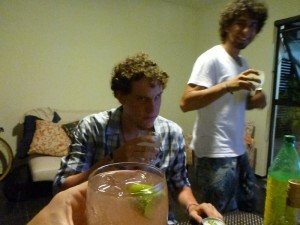 And remember we will always have that weekend in Guatemala!